Outlinely provides the best environment for ideas and insights. Packed with great features: Search & Navigate, Focus mode, Typewriter scrolling, Word counting. Outlinely is the ultimate solution for knowledge workers. - Each document is an outline. - Organize documents into Folders & Subfolders. - Access documents from anywhere with iCloud. - Bookmark a document and access them quickly from the Favorited folder. - Embedded link to other documents in Library. - Search for any word in the entire library with Open Quickly. - Search and go to any topic instantly with Search & Navigate. - Organize text into hierachical structure. - Expand to reveal detail, collapse to hide detail. - Zoom to any item (hoisting). - Drag & Drop to reorder items. - Add notes and links. - Make checklist, checkboxes, completed status. 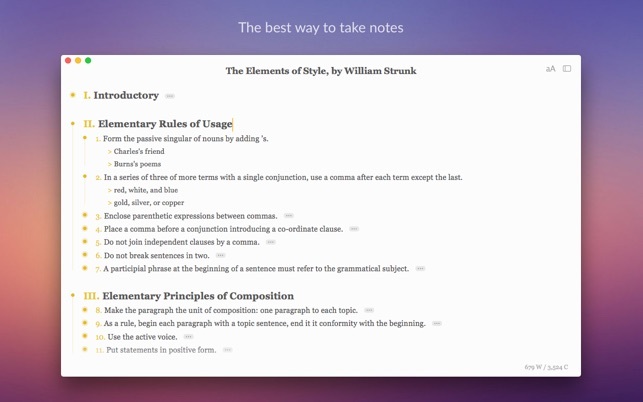 - Add formatting : Bold, italic, size, highlighted, strike-through. 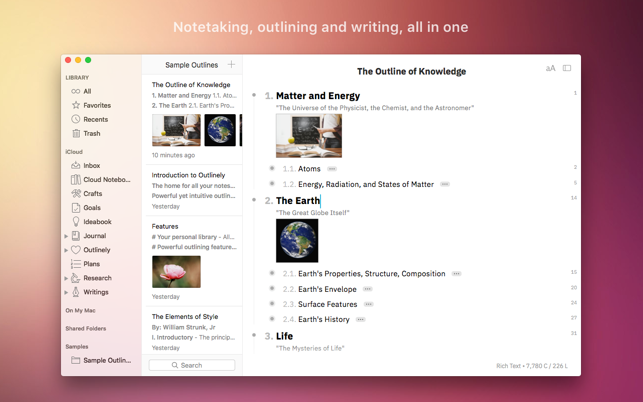 - It’s almost magical that Outlinely is both an outliner and a writing tool. - Keyboard navigation, copy/paste, search/replace, undo/redo. - Word count, character count. - Add tags to your topics. - Filter outlines with a single click. - Auto-complete when using previous tags. - Light/Dark/Sepia and many other beautiful themes. - Create your own custom theme. - Or you can import theme from Outlinely’s Theme Gallery. - Edit OPML files directly (Outline Processor Markup Language). - Export your outline to: OPML, PDF, Microsoft Word Document, RTF, HTML, Markdown, and plain-text formats. We put our best efforts into constantly improving Outlinely and your feedback is highly appreciated. You can contact us at outlinely@glamdevelopment.com or find us @outlinely on Twitter. We’d love to hear from you! - Dark Themes are optimized for Mojave Dark Mode. - Compability support for macOS Mojave. - Support Drag and drop a text selection from other apps. There are very few outliners that sync with a good native iOS app. If that is something you need, this is your best choice. For a while it seemed to be abandonware, but the developer has begun active development again and has been churning out steady incremental updates for some time now. Also, for those who don't like subscriptions, the iOS companion app offers a reasonable single-payment "lifetime subscription." Looking forward to seeing this app grow. I had purchased this app not initially feeling it was abandonware. But as months ticked by, it became concerning. I am glad I kept an eye out as the app served my needs well. 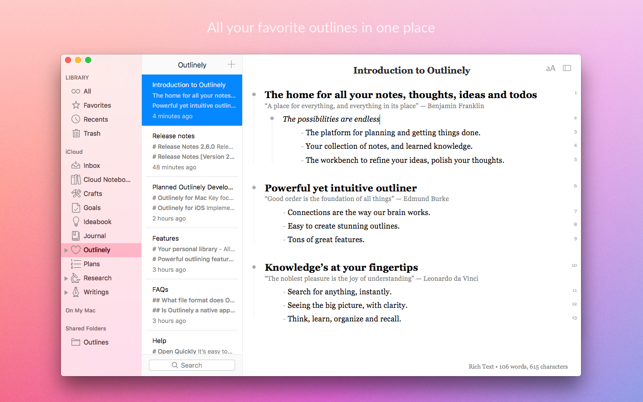 During the dark period, I stilled used the app, while trying others like: (OutineEdit, Cloud Outliner Pro, IA Writer, GoodTask and others), nothing fit the need as well as Outliney, and I am so excited they are back developing this awesome app. Keep it going! 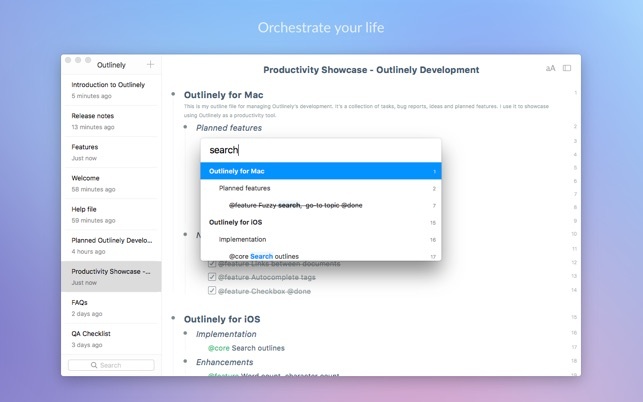 I love using Outlinely because of how easy it is to organize and structure documents. Editing text is easy and powerful. The origanizational features are strong. I can work across my MacBook, iPhone, & iPad without worry. 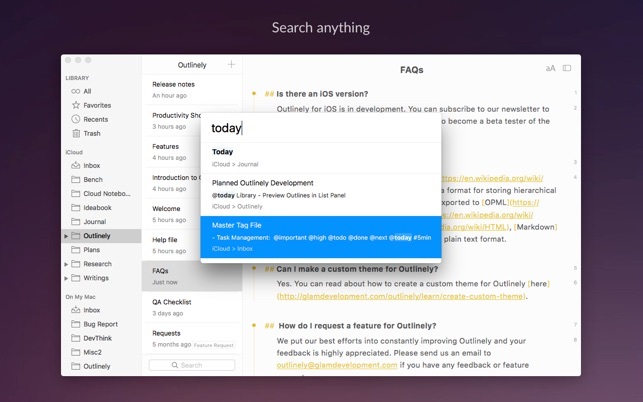 I'm delighted to see Outlinely being updated again and the addition of useful features. Copyright © 2013 - 2017 Glam Software. All rights reserved.